What are some of the biggest problems we see when it comes to goal setting? How many times have you set a goal and haven’t accomplished it because you lost your motivation and apathy took over? Or maybe it was because you got sidetracked and you just didn’t have enough time. Sometimes, it’s simply because you didn’t set the right kinds of goals. If our problem is all of those things, then how do we start by setting goals that we can actually keep? 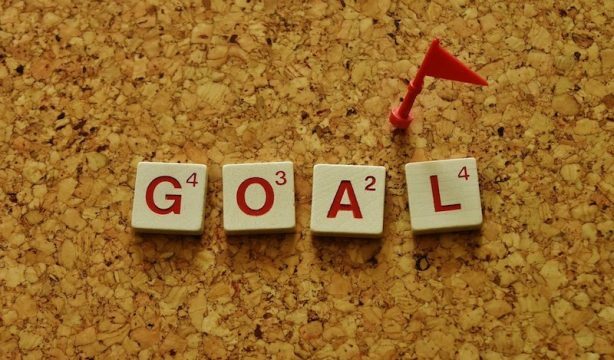 When it comes to goal setting in the workplace, commitment, perseverance, and focus are just a few traits you need to set yourself up for success. But it’s not just those traits that help you reach your goal. Some of the most crucial steps are often neglected in the goal setting process. So, how do we set goals and actually stick with them? Setting goals you are passionate about should be one of your top priorities. If your manager at work sets the overall goal to ‘sell more,’ determine how you can relate to that goal on a personal level. For example, perhaps you don’t personally relate to the company’s goal to sell more, but you want to learn the skills to become a better salesperson. This is referred to as cascading goals, which is the process of understanding your organization’s strategy and aligning it with your individual goals. Utilizing this process opens up a conversation between you and your manager and allows you to develop your individual skills and goals. Not only do you want to care about the outcome of your goal, but you should align your passion and personal goals with the overall goal of the company. Specific – Alison needs to grow her HR team to keep up with the company’s growth. Measurable – Alison will onboard 3 new HR employees during the second quarter of the year. She will hire 1 new employee per month so in 3 months she will reach her goal of 3 new employees. Attainable – Alison will first determine her needs and then write 3 different job ads. She will spend the first quarter of the year writing the job ads, accepting applications, and interviewing candidates. Relevant – By hiring 3 new employees, Alison will grow her HR team and align with the company’s need to grow as well. Alison and her team can better support the employees, increasing productivity and engagement. Time Bound – Alison will hire 3 new HR employees by the end of the second quarter. Clearly stating your goal is just one step of the goal setting process. Thinking about how to accomplish your goal will determine your strategy. Using S.M.A.R.T., you can plan each step needed to reach your goal. Creating a task list will help you clarify your strategy and it will give you something tangible to track your progress. You can also use your task list, or strategy, to better communicate to your coworkers and manager how you will reach your goal. So now that you planned your goal, how do you stick with it? Visibility helps you stay motivated and engaged in the process of reaching your goals. Although we try not to care too much about what others think, you are actually more likely to achieve your goals if there is a social expectation. Technology and shared software platforms can be a great way to share your goals and get others involved. You can make your goals public through software platforms like All Elements, allowing your coworkers and manager to see your goals. This level of visibility on a daily basis will help you stay focused and aligned with your company’s overall strategy. It can be hard to hold yourself accountable, but putting processes in place will help you stay on track. Regularly check-in with your progress by scheduling recurring 1:1 meetings with your manager. Be sure to ask for continuous feedback and encouragement, which will help you move forward and engaged in the process. The American Society of Training and Development conducted a study and found that if you have a specific accountability appointment, you are 95% more likely to reach your goals. Being open and transparent with your manager will not only help you hold yourself accountable, but your manager will hold you accountable as well. Once you get others involved, it will motivate you to accomplish your goal! Accountability is key. To be visible and to be accountable, you must communicate your goals clearly. Technology has many benefits that can help you keep track of your tasks and your progress. All Elements helps you clearly state your goal and your metrics, keeping you organized on a daily basis. All Elements allows you to publish your goals so your coworkers and managers can see, helping you stay aligned with your company’s goals. It gives you real time updates to help you stay motivated and focused. Don’t let yourself be overwhelmed by the goal setting process. Accomplishing your goals can be easy if you set yourself up for success. Stay organized, keep moving forward, and reach your goals! Start your goal setting process today!